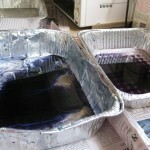 I had not dyed fabric before yesterday. 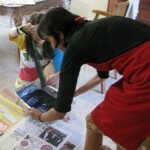 My friend Riki mentioned that she had some experience with it and she came over to share her knowledge. My daughter Danielle got up early to join in the fun. 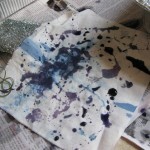 Everything was ready… The table was covered and the pans for the dye were out and scraps of cotton fabric were piled high. So we went at it. We used rubber bands and pipe cleaners to make swirls and circles. We wrapped fabric around rice and lentils using rubber bands. This came out a little different than just winding bands around the fabric. Riki made an accordion out of one piece of fabric, which resulted in stripes after she soaked up dye on each side of the accordion. Danielle and Riki decorated a tee shirt from Danielle’s closet. 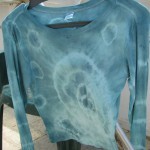 We read about different methods and dyes from dyeing expert, Paula Burch. Her site is really helpful and informative: //www.pburch.net/. 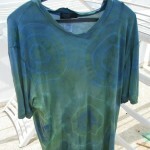 By the way, we used dye that works on cottons, called Rit dye (www.ritdye.com). 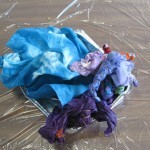 We poured a little bit of dye and some boiling water into aluminum pans and started dunking and swishing the fabrics in them. Although we wore gloves, we all ended up with teal colored fingers. Oh well, that’s the price for fun. Here are some photos of our morning. I’m ready to do it again! Who wants to join us? I read your comment. About what do you want to write this “guest post”? I understand at the end of the day it’s a way of getting a back link. But if you want to write a guest post, somehow related to textiles and fiber art, you may do so at NO cost to me. I agree to keep your link at the end of the post. Please confirm these terms by email. Be in touch and let me know what you are thinking of writing about. I will want to approve what appears on my site. It will need to be on topic, professional and on a high level.